We could have been recklessly unscrupulous and entitle this piece “The Stones of Venice”, picturing ourselves as second John Ruskins, praising the infinite beauty of this city and defending strenuously its fragile architecture. Of course, the history is in the stones, but is it the history of the stones? This is a short story with no morale, whose main characters are architectural artefacts, so dear to John Ruskin; a tale made of buildings, demolitions, grafting and subtraction. We are mentioning Venetian history only because our journey starts with a conspiration at Palazzo Ducale. “Hic fuit locus ser Marini Faletri, decapitati pro crimine proditionis” is written on a black drape that covers Doge Marin Failer’s face. You will certainly notice it looking at the seventy-six portraits of the dogi hanging at three of the walls in the Great Council’s room (it is the 55th). The traitor doge gives us the perfect opportunity to mention another conspiration that took place in 1310, of which he was the protagonist as well, this time, ironically, he was against the conspired Marco Querini and Bajamonte Tiepolo, in the capacity of member of the Council of X, bastion of republican orthodoxy. Political history reflects on the city’s architectonic history, not only to celebrate, but also when it is time to delete. The walk that follows brings us on the trails of the conspired, through the history of the stones that used to belong to them, and the futile attempt to delete all the evidence. Then, we walk towards Campo Sant Agostin. There you will struggle to find, among all the “masegno”, a plaque that reads: LOC. COL. BAI. THE. MCCCX, which means “Location of column of Bajamonte Tiepolo 1310”. In fact, in this place once stood the column of infamy. Bajamonte’s rooms were destroyed but its marbles were reused to build church of San Vio. We will now move to a different sestiere, going towards the homonymous campo. We could say that Ossa overlaps with Pelion, because coincidentally, church of San Vio does not exist any longer either, sacrificial offering to urban rationalization, but do not worry: Bajamonte’s marble are hard to die and they survive the umpteenth demolition. 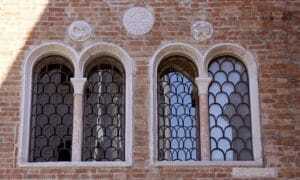 Probably they are the ones that you can admire on the façade of the homonymous San Vio Chapel, now a private house. In order to pay a visit to the second conspired we shall now go to Rialto market. Here, once stood the Marco Querini’s family palazzo. Private properties too incurred the wrath of the Serenissima, that razed everything. Not to worry though, even in this case it was no total demolition. Please admire Rialto’s fish markers archways: rumours say that they are the same that used to frame the balconies of his bourgeois residence. Nothing is destroyed, everything is transformed, one could say. Forty charming and comfortable rooms where guests can experience a magical and old-fashioned atmosphere. A mixture of multi-ethnic furniture and an original design created by Italian artist and designers for nine rooms all diferent decorated. An italian design apartment completely custom made that welcomes travelers with all the comforts, authenticity and freedom of a private home in Venice.